With 10 years (almost as 2016 is missing) of Tour de France finishing climbs on the spread sheets, it seemed time to have a look back and see if there was an interesting trend. 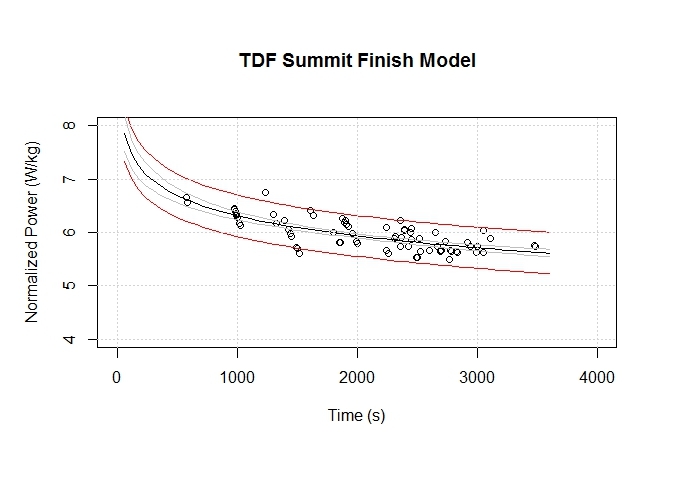 First to normalize the performance I used the Martin model assuming a Froome size rider of 67 kg and about 50% of ideal drafting for a CdA of 0.3. 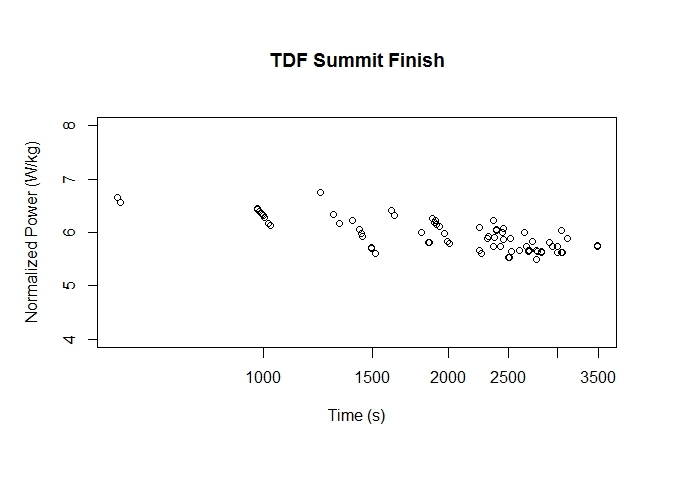 Then I used Townsend’s Critical Power altitude correction polynomial and normalized the power to a mean mid altitude of 1208 m.
What we see here is that our best model based on the Bayesian Information Criteria which balances model fit versus over-parameterization includes log(Time) as expected, length, and plus minus stage. 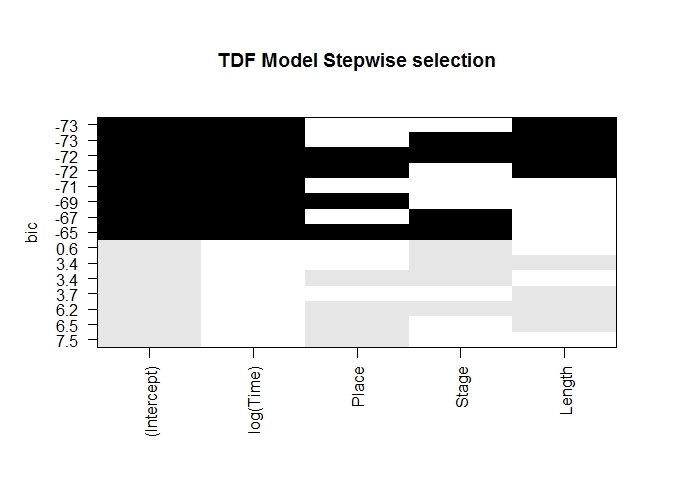 Paradoxically, length was positively correlated with climbing power so with some hesitation I kept that in but dropped place and stage from the model. Things look pretty good. The black line is the model, the faint gray line is the confidence interval of the model and the dull red line the prediction interval. The black line is the mean, box and whiskers the quartiles, and circles are outlier points. 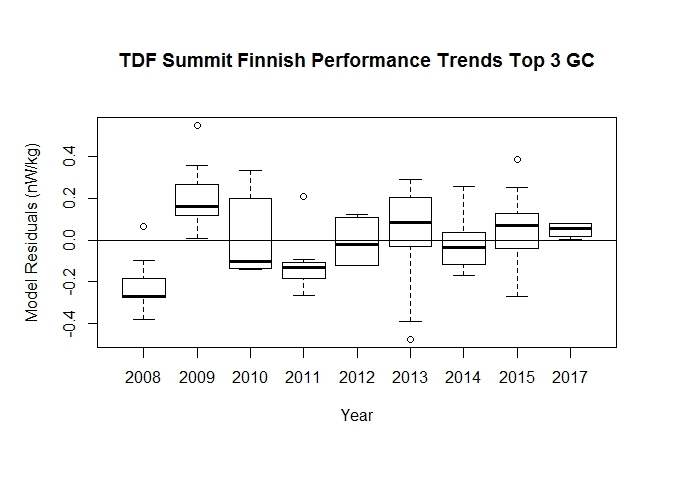 As far as trends go, maybe the performances are more homogenous but otherwise the trend is effectively flat with year not being significant (P = 0.15). 1. 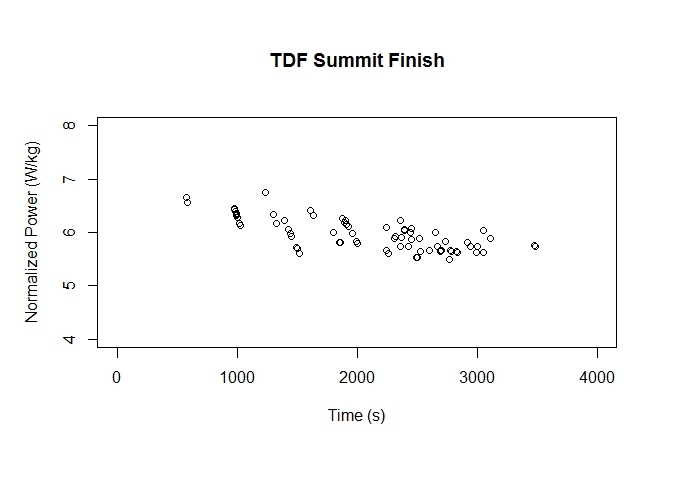 Why are finishing climbs faster at the end of longer stages? My guess is that the longer the slog up to the final climb the more cautious the GC racing is up to it… maybe? 2. Where are the motors ? 3. Why are bikes nearly twice the price; a top shelf 2008 Madone $7,700 vs 2017 Madone $13,000 ? I would expect 10 years of technological advancement in a man+machine type of sport to show up. The good news, and I’ll call it that as much as my popularity seems to hinge on playing does it dope, is that over the past 10 years there does not seem to be an emergence of some new doping rocket-fuel. I’m by no means naive enough to see this as evidence of a clean sport. But it does at least support the idea that the illicit march has stalled for now.